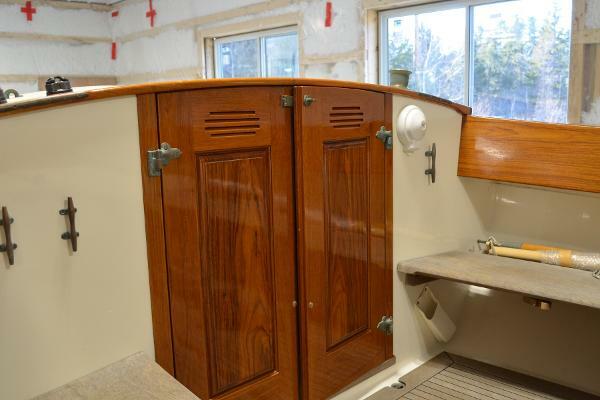 HULL/DECK Hand laminated infused vinylester solid glass hull with cored transom. 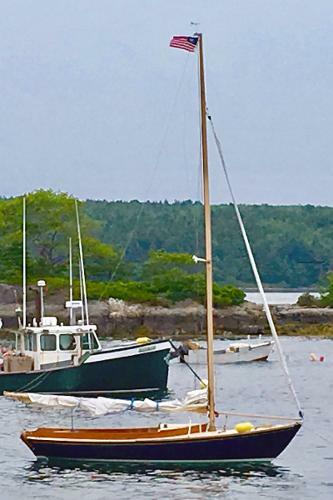 Flag blue hull, Awlgrip painted (2017). Fiberglass molded rudder with core. Painted boot top (White Awlgrip) and pale gold cove stripe. 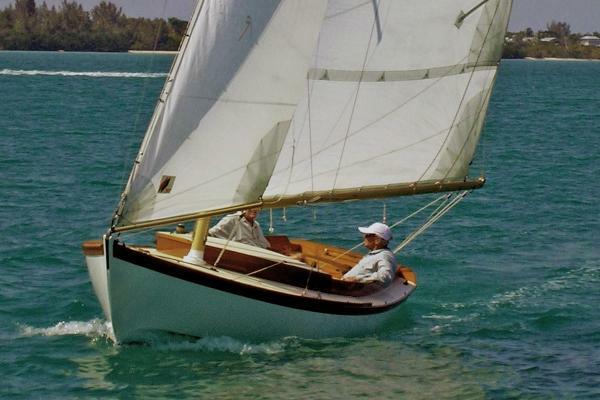 Lead ballast full keel is externally bolted with SS bolts and the rudder pintles and gudgeons all are high grade 316 stainless steel. Deck is laid up fiberglass cored with end grain balsa and finished in “Cream” colored Awlgrip with non-skid additive. 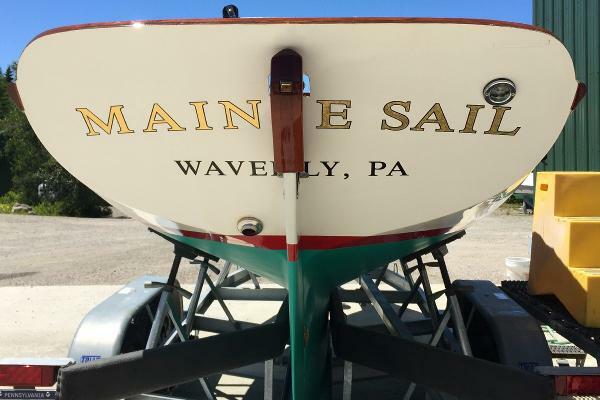 Custom cast bronze hardware includes a 10” hollow cleat on foredeck, 2 solid 7” aft cleats and a pair of fitted bow chock. 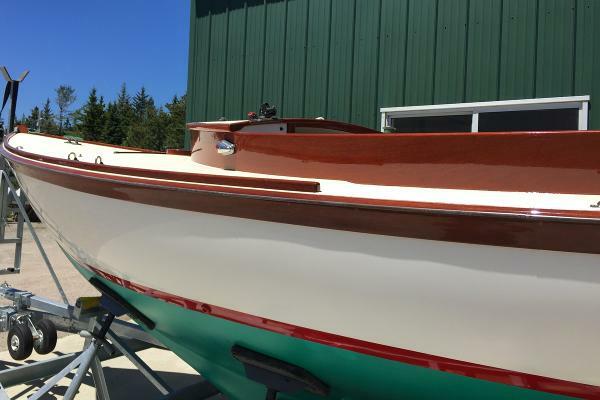 2017 Awlgrip professionally repainted- Hull, boot stripe, decks and cove stripe Interprotect epoxy bottom sealer with epoxy primer and green (Petit Hydrocoat ECO) antifouling paint Varnished teak inner transom Natural teak toe rails COCKPIT Large, deep and roomy 9’ long cockpit with 6 ½’ seats angled in harmony with the coamings for comfort. Seats, coamings and trim are teak. Deep bilge compartment is easily accessible for pumping through a lift out hatch in the sole. 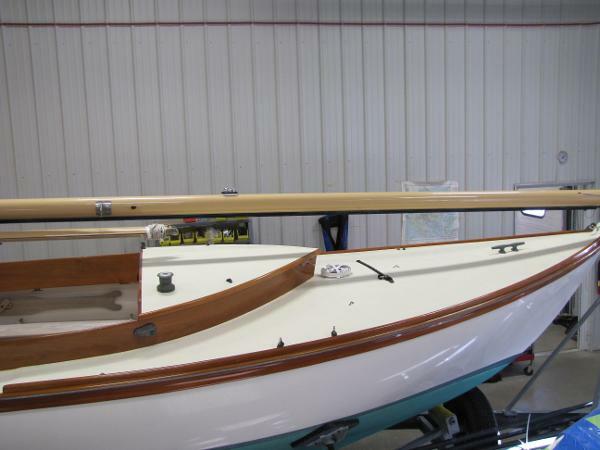 The inside of the boat has two separate hand laminated molded liners that are bonded to the hull serving as structural bulkhead and stiffeners. All visible surfaces inside the hull are finished in easy to clean white Gelcoat. Varnished ash tiller Teak boom crutch with stowage Teak decking in cockpit sole Seat extended with shelves and drink holder (Port and Starboard) Custom varnished teak doors with removable hinges RIGGING The mast is keel stepped and includes two internal halyards and two topping lift (main & jib). All halyards, Reefing controls and jib sheet are led aft over cuddy top and are easily controlled from the safety of the cockpit. Mainsheet tackle is a 4:1 aft boom control leading to a fairlead with Cam cleat near the helmsman. 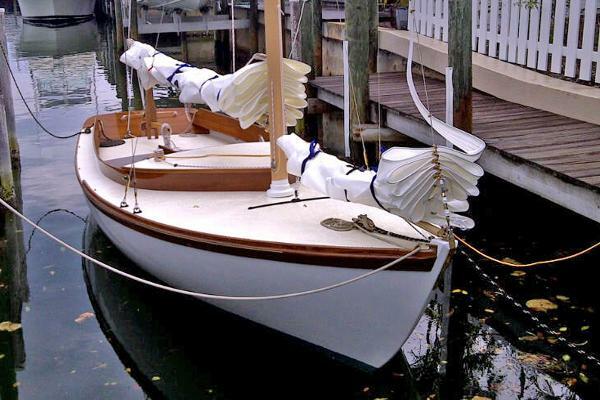 Standing rigging is 1 X 19 stainless steel shrouds with bronze turnbuckles. Running rigging is low stretch braided rope. 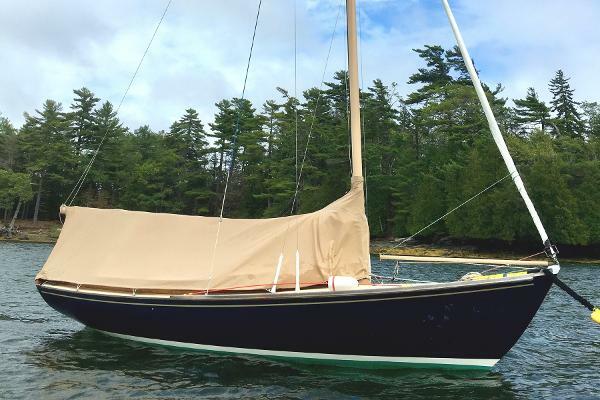 Main sheet- Harken traveler system Marconi rig-Carbon mast jib club (Awlgrip painted) Schaeffer Roller furling (2016) Painted aluminum boom Mast head Windex Burgee halyard with varnished ‘Pig Stick’ Locking winch handle and stowage pocket SAILS AND CANVAS Sails by Maine Sailing partners: Mainsail with one reef Self tending furling jib Spinnaker Package with, rigging and carbon pole Cockpit boom tent/mainsail cover with zipper and hardware (Toast colored Sunbrella) Jib sail cover (Toast Sunbrella) INTERIOR The cuddy cabin includes two outboard shelves with fiddles, hanging hooks for lines and foul weather gear. Positive flotation in three watertight compartments with inspection hatches; one forward of the mast and one under the sheet/stern deck can also be used for stowage the thirdcompartment is located under the cockpit soles and is not accessible to stow gear but has an inspection port. EQUIPMENT Manual bilge pump with handle mounted in cockpit bilge sump Fenders with custom fender covers Bulkhead mount Plastimo Mini Contest Compass Torqueedo Travel 1003 electric outboard with custom removable stainless steel bracket (Gunwhale mount) Galvanized steel cradle COMMENTS: Ayita has been professionally cared for and is a beautiful example of the Pisces with a marconi rig. 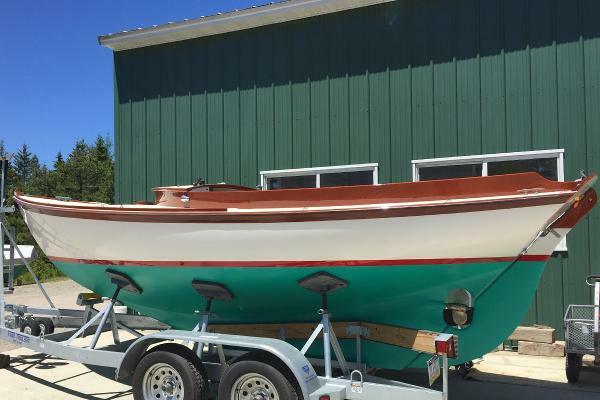 Winter 2019 upgrades include exterior wood teak professionally varnished and bottom painted. Ayita is in beautiful condition and ready to launch.